If you have a Gmail account on your phone (or laptop) log in and then open the Google Maps app (or the maps website on your laptop). Click the menu at the top left and go to “your timeline”. 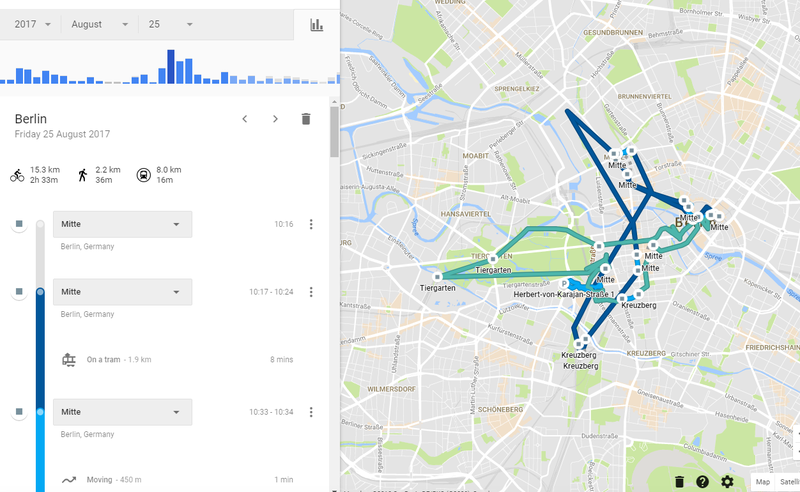 If it’s like me, it should be able to tell you your exact movement, places visited, modes of transport and all… right down to the minute (here’s one day I was on holiday in Berlin – yes I cycled 15km that day). Now we all know our phone has GPS and the the NSA are probably tracking our every word, but to have it shown to me (and people I showed this to) in such stark detail was deeply unsettling. To switch it off go to “Manage location history”. There’s always a price to a free service. Omg I just went on to my phone and was shocked as you were when I checked the Maps app I had no idea that was happening I have turned off the Location History, thanks for the heads up! They say you learn something new everyday…..
I’ve had this turned off for years. You should also check out what Twitter and Facebook have stored about your interests based on your own tweets and statuses! Delete delete delete!